After a light coat of paint and an all-new open floor plan, this 1950s ranch-style house looks as good as new! When Aisling Mittman moved to her new home in Los Angeles, it looked trendy for the decade in which it was built ... the 1950s. It's no surprise that Mittman, the vice president of brand and design for interior design app Hutch, purchased the ranch-style home with grand ideas for a major renovation. And the kitchen has the most dramatic update. "We closed on our house in March 2017 and started work immediately," Mittman told TODAY Home. "The entire house had dark brown wood paneling and red brick." 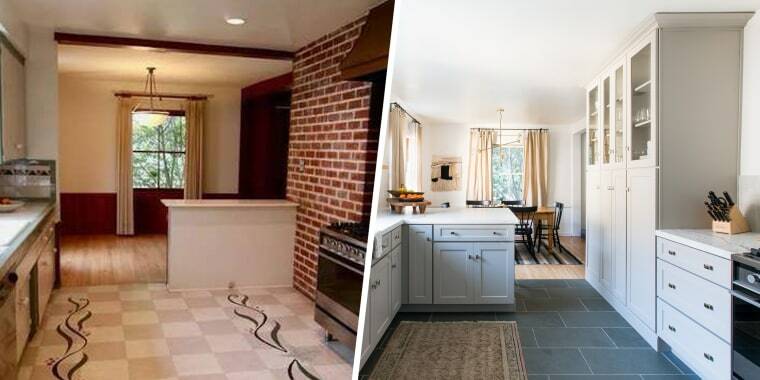 Those dark wood accents and exposed brick walls carried into the kitchen, which also featured some very — ahem — interesting floor tile. Luckily, the couple found inspiration from their honeymoon in Stockholm. The hotel they stayed at featured interiors by Isle Crawford, a London-based designer who mixes "traditional and modern elements, all within a neutral palette." This helped the couple streamline their top goal for the kitchen: to lighten it up! "We painted everything 'Simply White' by Benjamin Moore," said Mittman. "It truly transformed the space." After some color-correction, Mittman set about making the decades-old space more "timeless and comfortable" for their family. "We added a peninsula which gave our galley kitchen plenty of counter space for meal prep and entertaining," said Mittman. "I am big on storage space, so it was fun to plan the cabinets to be super functional." Mittman and her husband factored the cost of renovations into their purchase price and spent about 50,000 on the house-wide updates. Choosing a lighter hue on cabinets and walls and opting for more storage space in the kitchen are simple, affordable updates that anyone can use. "I love our new kitchen! It makes cooking more enjoyable," said Mittman. "I spend a lot of time in there."